"It was the custom of the East, and in its earliest ages, to detach every profane object, or relic, or even sentiment, with the utmost scrupulousness from the sacred shrines of their gods. This practice will be found to have prevailed invariably amongst the ancients - those that observed the law, and those that neither observed nor knew it. Mount Nebo witnessed the last moments of Moses' mission upon earth. Where was Aaron laid at rest? Abraham was entombed in the cave of Machpelah, even the holy sepulchre of our Lord was appointed in a garden: nor do idolaters of all classes appear to have been less attentive to this regulation. Whatever may have been the root, origin, or source of the practice, in all Eastern countries cemeteries are detached from places of worship. The Chinese extend the regulation still further, for they strictly prohibit interment within the walls, or suburbs, of any town or city; properly concluding, that the resting-places of the dead should be at a suitable distance from the dwellings of the living. And this example is now beginning to be followed: Parisians have their celebrated Pere la Chaise; Londoners, their joint-stock cemeteries; and in some instances, ancient tombs have been removed from the choir-wall, to which they seemed to have a prescriptive right, and consigned to spots less holy. Custom, long use of privilege, tacit admission of an indulgence for a lapse of years, produced in the minds of European Christian communities so strong a prejudice in favour of interment, not only in churchyards, but within the sacred temple-walls, that all attempts to induce its abandonment have proved abortive, until recent years. The Grand Duke of Tuscany was the first European who endeavoured to establish a public cemetery, at a convenient distance from his city of Florence; but the attempt to remove the coffins from the vaults of the different churches produced an insurrection amongst his subjects. 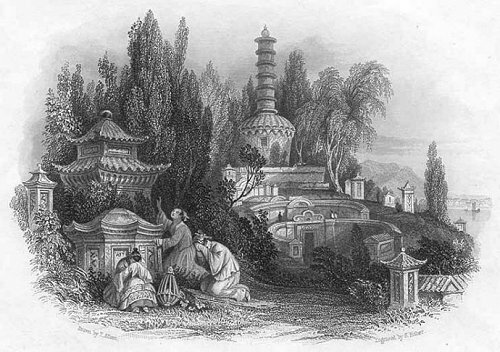 "Chinese pagodas, Mohammedan minarets, and Irish pillar-towers, are independent structures, removed some little distance from the temple, or mosque, or basilic, because their immediate uses were not sacred. In later ages, the tower was placed on the basilic, and became the pedestal of the tapering spire. Cities of the dead, therefore, are in China separated from those of the living, but furnished with buildings and structures, and designs if possible more various and fantastic. A barren district, especially if the site be open and agreeable, is chosen for the demesne of the dead; and here the graves of the poor are seen in countless assemblages, resembling the barrows so frequently observed in Asia Minor, as well as in many parts of Europe. The rich, however, assert their prerogative of distinction even in the grave, by the eccentricity and pomp of their vast mausoleums. Buildings of stone, or brick, often two or more stories in height, distinguish the mandarin's last earthly tenement. The designs are circular, polygonal, or some other regular mathematical figure, and frequently a mural defence of considerable strength effectually prevents intrusion. The crescent is a favourite shape for an enclosure, and midway between its horns is placed a pillar, or obelisk, or urn, or other sepulchral erection. Paths deeply worn between the many monuments attest the strength of filial piety, the grief of a widowed heart, the immitigable character of maternal sorrow ; and along these evidences of a broken spirit may hourly be seen the mourning train, passing to perform the last sad rites of sepulture, or to pour forth unavailing sorrow over a spot that just witnessed a similar scene. When the soil permits, trees of a drooping kind are generally planted amongst the tombs. The weeping-willow, and lignum-vitee with its pensive branches, are the usual accompaniments of these sad localities, besides the cypress, always beautifully sombre. "It is customary in China to have coffins prepared for the occupancy of particular tenants, from their youth upwards. The Emperor provides his coffin on the day he ascends the throne. Contributions are given to the friends of the poor, to provide handsome coffins; and the humblest classes desire nothing more than that their remains shall be laid in "the eternal mansion," in a coffin of cedar, or other odoriferous wood. This point being happily accomplished, the soothsayers are still to be consulted as to the most lovely and suitable spot "in the ten-thousand-years' felicitous ground," and it is from the delay which this functionary makes, while pretending to learn the will of the gods, that the unseemly exhibition occurs, of coffins lying exposed upon the pathway, upon the greensward, or beneath the shelter of a tree. It sometimes happens that the priests are unable to ascertain by the Sticks of Fate, or otherwise, where precisely the remains should be interred: should the delay be so protracted, that decay actually takes place, then the patient relatives, placing the body on a pile, submit it to combustion; after which they carefully collect the ashes, and deposit them in a funeral urn."